southern Madhya Pradesh and Central Ganga Plain.  Wadia Institute of Himalayan Geology, Dehradun, Uttarakhand.  Centre of Advance Study in Geology, Lucknow University, Lucknow.  Uttar Pradesh State Archaeology Department, Lucknow.  Kumaon University, Nainital, Uttarakhand.  Physical Research Laboratory, Ahmedabad.  Jawaharlal Nehru University, New Delhi.  Bhabha Atomic Research Centre, Trombey.  Charles Darwin University, Darwin, Australia.  Institute of Archaeology, University College, London.  University of Oxford, U.K.
 Life member-Palaeobotanical Society of India, BSIP, Lucknow.  Member - Botanical Society of India, 1993-1994. 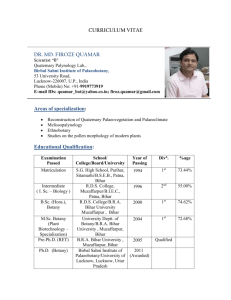  Life member-Palaeontological Society of India.  Member-International Society of Plant Morphologists, New Delhi, 20012002, 2010-2012.  Member-International Society of Applied Biology, Lucknow, 2008, 2009.  Mahatama Jyotiba Phule Rohilkhand University, Bareilly (U.P.).  Dr. Bhim Rao Ambedkar University, Agra (U.P.).  Chhatrapati Shahuji Maharaj University, Kanpur (U.P.).  Lucknow University, Lucknow (U.P.). Gaertn.) forests in Madhya Pradesh, India. 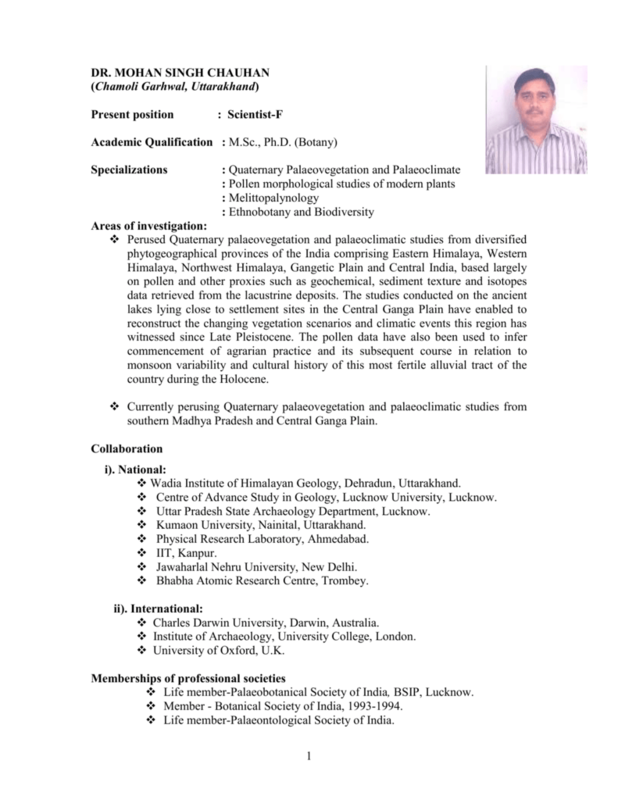 Palaeobotanist, 43: 89-101.
changes in northeastern Madhya Pradesh. Palaeobotanist, 49 (3): 491-500. Madhya Pradesh, India. Current Science, 83:1444-1445. Madhya Pradesh. Gondwana Geological Magazine, 19 (2): 165-175. Himachal Pradesh. Current science, 91 (11): 1572-1578. Madhya Pradesh. Geophytology, 37: 119-125.
tropical deciduous Sal (Shorea robusta) forests, district Sidhi, Madhya Pradesh. Taxonomic Botany, Additional Series, 10: 129-135.
deposits. Palaeobotanist, 57 (1&2): 265-275. Kathauta Tal, Chinhat, Lucknow. Geophytology, 21: 191-194.
from Chamaraja Nagar District, southern Karnataka. Geophytology, 39 (1-2): 4147. Ganga Plain, U.P. State Archaeology Department, Lucknow, Pragdhara, 15: 3338. Kabir Nagar District, Uttar Pradesh, India. Man and Environment, 34 (1): 88-100. Southeastern Madhya Pradesh during late Holocene, based on pollen evidence. Journal of Geological Society of India, 76 (2): 143-150.
from Harda District, Madhya Pradesh. Phytomorphology, 60 (3&4):122-127. Geological Society of India. India, 80: 470-480.
change in southwestern Madhya Pradesh, India. 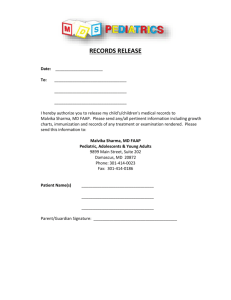 Current Science, 103 (12):14551461. Madhya Pradesh, India. Palaeobotanist, 62 (1): 47-53. Western Doon valley of Northwest Himalaya. Palaeobotanist, 50: 403-410.
human habitation in the Central Ganga Plain during the last 10,000 years. Biodegradation of Cultural Property, NRLC, Lucknow, 412-426.
of Kumaon Himalaya. Geophytology, 23 (1):147-153. 30. 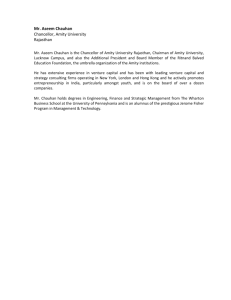 Chauhan, M.S. & Sharma, C. (1996). Late-Holocene vegetation of Darjeeling (JorePokhari), Eastern Himalaya. Palaeobotanist, 45:125-129. Dewar Tal area, Inner Lesser Himalaya. Palaeobotanist, 49 (3): 509-514.
during Late-Holocene in Garhwal Himalaya. Palaeobotanist, 46: 211-216. Plain. Journal Palaeontological Society of India, 49: 27-34.
from Unnao district, Uttar Pradesh. Journal of Applied Biosciences, 36 (2):133136. District, Uttar Pradesh. Journal of Applied Biosciences, 37 (1): 48-51.
vishleshan. Vigyan Garima Sindhu (In Hindi), 19: 11-12.
implications. Journal Palaeontological Society of India, 53 (2): 197-205.
record of last 2000 years in Trans-Himalayan Lahul-Spiti region. Proc. 41. Mehrotra, R.C., Liu Xiu-Qun, Cheng-Sen Li, Yu-Fei Wang & Chauhan, M.S. Palaeobotany and Palynology, 35 (3 &4): 145-163. Fund for Nature, India, New Delhi, 89-91. Manipur, based on pollen and chemical evidence. 44. Patnaik, R., Chauhan, P.R., Rao, M.R., Blackwell, B.A.B., Skinner, A.R., Sahni, A.
locality, central India. Journal of Human Evolution, 56: 114-133. 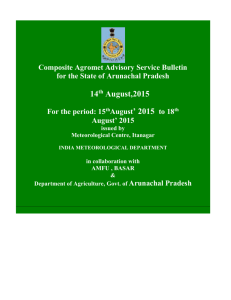 Pradesh, India and their significance in assessment of past climate. 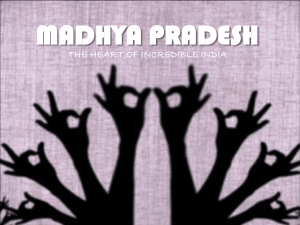 Madhya Pradesh. Geophytology, 38 (1&2):57-64.
village, Betul district, Madhya Pradesh. Current Science, 101 (12): 1586-1592. District in southwestern Madhya Pradesh. Geophytology, 41 (1&2): 55-60. District, southwestern Madhya Pradesh (India), based on pollen evidence. change, Central Narmada Valley. 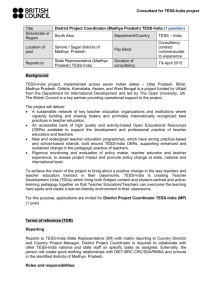 BSIP Newsletter, 8: 22-23.
sediment. Current Science, 90 (11): 1547-1551. Quaternary palynostratigraphy of Himachal Pradesh and Kumaon, India. Proceedings of Indian National Science Academy, 54A (3): 510-523.
International Geological Congress, Japan, Part B: 279-286.
palynostratigraphy of Himalaya. The Himalayan Environment, 193-207. (Sikkim), Eastern Himalaya. Journal Palaeontological Society of India, 46: 5158. Garhwal Himalaya during last 4,000 years. Palaeobotanist, 49 (3): 501-507. Special Publication, 65 (3): 199-202.
palynological evidence. Journal of Geological Society of India, 69 (1): 92-96. 63. Sharma, S., Joachimski, M.M., Sharma, M., Tobschall, H.J., Singh, I.B., Sharma, C.
Sanchi dams. The Asian Perspectives, 46 (1): 166-201.
of Lake Priyadarshini, Eastern Antarctica. Palaeobotanist, 49 (1): 1-8.
significance. 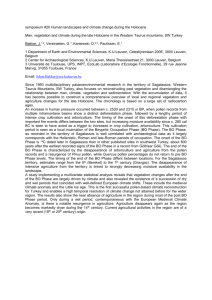 Journal Palaeontological Society of India, 53 (1): 73-81.
significance. Journal Applied Biosciences, 34 (2): 152-156.
terrestrial and marine records of the climate of South Asia during the Holocene. 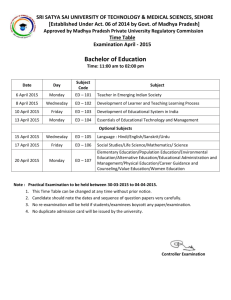 study in Jalesar, Unnao District Uttar Pradesh. Journal of Palynology, 47: 11-21. Jalesar Tal, Unnao District, Uttar Pradesh, India. Current Science, 103 (5): 555562. 75. 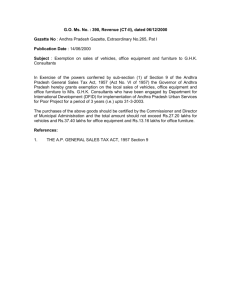 Trivedi, A., Singh, D.S., Chauhan, M.S., Arya, A., Bhardwaj, V. & Awasthi, A. Society of India, 56 (1): 39-43. 76. Vishnu-Mittre, Sharma, C., Saxena, A.K., Bhattacharyya, A. & Chauhan, M.S. (1984). Pollen stratigraphy of India. Puratattva, 13&14: 132-139.
and climate change. Journal of Geological Society of India, 68 (1): 95-102.
a pilot study from the Gangetic Plain. 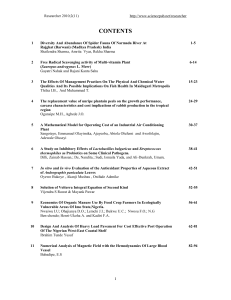 Journal of Asian Earth Sciences. Lake, District Unnao, Uttar Pradesh. Excavation of Sachankot, Uttar Pradesh. Lucknow, Uttar Pradesh, India. Journal of Environmental Biology.